Scott Todd is no stranger to running, especially in the name of cancer research. 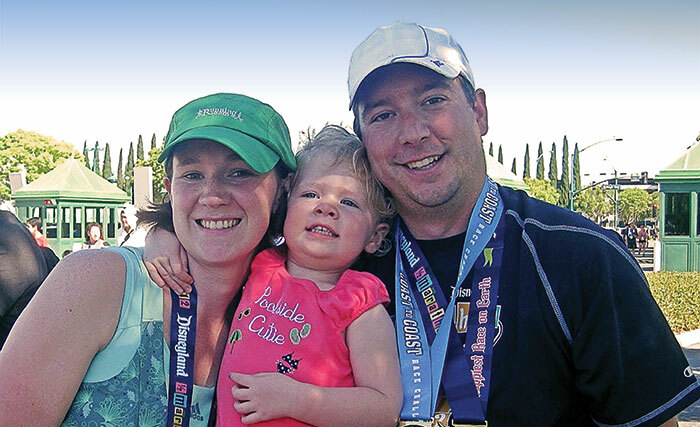 Todd began his marathon career in 2011, after he was diagnosed with Hodgkins lymphoma. His goal was to complete the Disney World Half Marathon after treatment. Inspired by the runDisney events, he began his “Coast to Coast Challenge,” which culminated in running a marathon on the east and west U.S. coasts. “The runs have provided a goal to work towards. The generosity and motivation from the donations has also helped push me to complete all the runs,” says Scott Todd. Eventually, Todd completed both the 2012 Disney World Half Marathon and the 2012 Disneyland Half Marathon. He was hooked, and seeing the success of his first two runs, moved on to complete the 2013 Disney World Tower of Terror 10 Mile night run when he was in remission. The proceeds from each marathon went to support the Cross through the Alberta Cancer Foundation. The third round of his fundraiser, which he dubbed “Help Me Help Others Like Me: Scott’s Running Away From Cancer,” raised $4,000. Funds raised for the first three runs totalled almost $15,000. As if one person in the family with cancer weren’t enough, with his wife Kristy’s diagnosis of the rare Merkel cell carcinoma in December 2013, Todd “couldn’t pass up another opportunity” to run again. After Kristy received “phenomenal treatment” from the Cross Cancer Institute and University of Alberta Hospital, the entire family ran the 2014 Disneyland Half Marathon. Just out of treatment, Kristy hit the ground running – participating in the 10-kilometre event, while their daughter ran in the kids’ race. The Todd family goal was to raise $4,800, which they exceeded. His latest fundraiser brought in $9,180, elevating Todd’s total raised to almost $25,000. He admits that there were struggles, especially in 2012, when he was still in treatment. “At first I was tired just from taking walks,” Todd says. “It was frustrating having such physical challenges in training when I hadn’t had them when I trained for my first run in 2011.” Gradually, Todd worked his way up from walks to short runs. Todd says donations go towards great research, medical advancement and improving patient care. “Kristy and I have sat in the chairs and beds that many have, and unfortunately many more will,” he says.